A FOUR-DAY celebration of Alan Turing’s legacy held in Knutsford has been W hailed a resounding success by organisers at Knutsford Promenades. With more than 50 events taking place across town as part of Heritage Open Days – a nationwide celebration of history and culture – Knutsford took centre stage by hosting one of four commissioned projects. In line with HODs’ LGBT theme of ‘Unsung Stories’, the infamous Regina v Turing and Murray trial at Knutsford’s crown court was brought to life as a performance orchestrated by RE-DOCK. Visitors in their hundreds took the chance to watch three live productions of the trial in the very building it took place 65 years ago, while more took advantage of a virtual reality experience of the court proceedings. 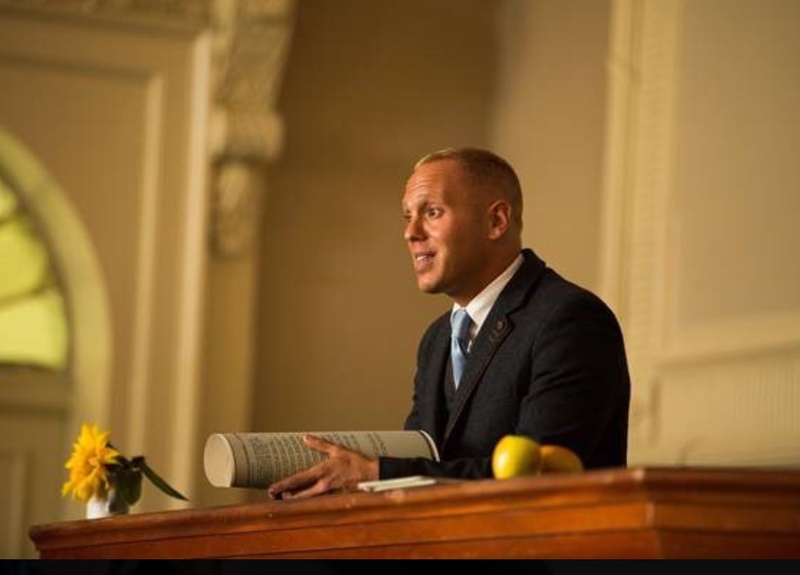 Turing-themed events took up almost half of the Promenades’ programme, with highlights including Sir Dermot Turing and Rob ‘Judge’ Rinder speaking as part of a ‘Salon’ event at The Courthouse. Celebrating the renowned codebreaker’s legacy, other events included Turing’s Mechanical Calculator at Tabley House, cocktail ‘mixology’ at The Lost and Found, artificial intelligence golf and Run Knutsford’s ‘Turing 2:46’ event in honour of his best marathon time. The Grade I-listed Brook Street Chapel – home to the grave of Elizabeth Gaskell – displayed the Quarter Sessions records. Sarah Flannery, founder of Knutsford Promenades, said: “I am happy beyond words to see such a huge undertaking succeed. From the simple idea of exhibiting the Quarter Sessions records of Regina v Turing and Murray in the very court room of the trial, the potential to tell the full story of an extraordinary man and his legacy, and the impact of an event that took place here in Knutsford, unfolded into a town-wide celebration curated into a 54-event festival that revealed fresh insights into Turing, Murray, and other aspects of our heritage and culture. “Its success is thanks to the generosity of Cheshire East Council and our sponsors, the support and participation of local venues, organisations and individuals who opened sites and put on events and displays, the guest speakers for the ‘Salon’, the cast and creative team of Regina v Turing and Murray, national HODs, The Courthouse, Cheshire Archives and Local Studies, volunteers who helped with social media and the website, the Knutsford Hosts and Lions, town council officers and of course the visitors from Knutsford, Cheshire and beyond who turned up in their thousands. A number of Knutsford’s famous historical buildings were also open to the public as part of the Promenades’ programme. This entry was posted in News and tagged Cheshire East Council, Knutsford, Knutsford Guardian, Knutsford Hosts, Knutsford Lions, Knutsford Promenades, Knutsford Town Council by Host. Bookmark the permalink.